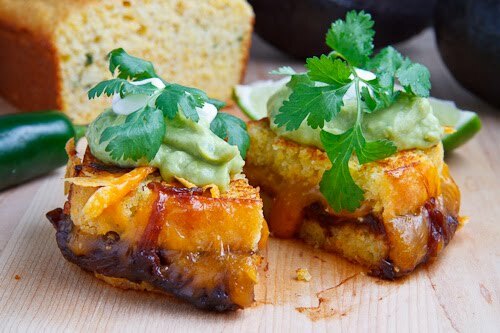 Jalapeno cornbread sandwiches stuffed with refried plenty of cheese, black beans and chipotle caramelized onions that are grilled until the cornbread is golden brown and the cheese has melted. The sandwiches are then served with a topping of cool and creamy guacamole, a dab of sour cream and some fresh cilantro. Mmmm… so good! Making the jalapeno cornbread to go with the chili was just an excuse because what I really wanted it for was to make some really special jalapeno cornbread grilled cheese sandwiches. I first came across the idea for this cornbread grilled cheese at a recent Toronto Underground Market where Comida Del Pueblo was serving them and boy did they ever look good! Unfortunately the long line kept me away and before I knew it I was out of time and it was too late. 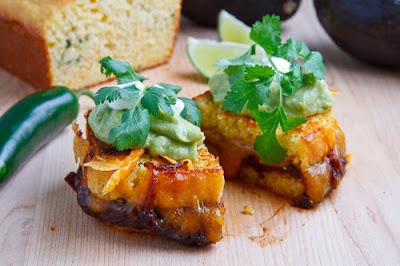 Rather than become depressed I simply saw this as a challenge to make them at home based solely on the description of the jalapeno cornbread grilled cheese with chipotle caramelized onions, refried black beans and guacamole. 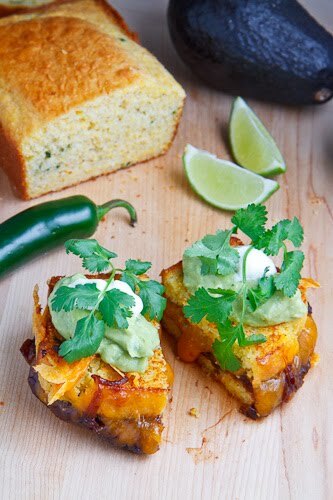 Luckily I was familiar with making all of the ingredients and had recipes for the chipotle caramelized onions , refried black beans , and guacamole so I only needed to come up with the recipe for the jalapeno cornbread and then combine everything, add some cheese and grill it up. Making all of the ingredients from scratch can take some time but it is well worth it as they make one amazingly spectacular sandwich! Once you have all of the ingredients ready, these sandwiches are as easy to make as buttering up the cornbread, throwing it into a pan, topping it with cheese, onions, beans, more cheese and the remaining cornbread before grilling it until the cheese melts and the cornbread is nice and golden brown. The cornbread does not hold together too well so you have to be gentle when flipping the sandwiches and even then I ended up eating them with a fork but they were so good that I did not mind at all. The cornbread grills up nice and buttery crisp on the outside and yet it remains light, moist and tender on the inside. The chipotle caramelized onions provide the fiery heat that the creamy refried beans and melted cheese do a great job of balancing out. Overall the filling is still on the spicy side and when combined with the sweetness of the cornbread, the coolness of the avocado and tangy sour cream, it literally creates magic in your mouth! These are so addictively good! I already need another loaf of jalapeno cornbread! Butter up one side of each slice of cornbread, put half of them butter side down in the pan, sprinkle on half the cheese followed by the onions, a dollop of refried beans, the remaining cheese and cornbread with the buttered side up. Grill until golden brown, carefully flip and continue grilling until the other side is golden brown and the cheese has melted, about 2-4 minutes per side. Top with guacamole, sour cream and cilantro and enjoy! More amazing grilled cheese sandwiches. Wow, I have no words for this. I already ate dinner tonight and I think I hear my stomach grumbling as I look at these pictures. Need to try this!! Now this a a grilled cheese I can get behind! Potential new fav food?? Awesome. Yum! That looks so good! All the flavors sound delicious together! What a gorgeous grilled cheese sandwich! One day I'm going to arrive at your door requesting this. Not even joking. Seriously, this isnt even fair. Wishing I was having this right now. Sounds AMAZING. Does that come with a margarita? If so, that might just be my last meal. Yum. This looks like the perfect way to warm up this winter! I love revitalized and excitingly new grilled cheeses! What a glorious combination, and beautifully served! I am truly hungry now after reading this post. Should I be glad you shared it, or frustrated that I'm nowhere near my kitchen at the moment when you torment us with such gorgeous stuff?! Awesome sandwich!! Love everything in it! kevin this is how grilled cheese should be done from now on. YUM. I can't even describe how excited I am to try this. Rarely do I get all antsy about trying recipes I find on blogs… but this looks AWESOME. I would love to try this recipe! The link to your refried bean recipe calls for pinto beans, did you just substitute black beans? nana linda: Yes, just replace the pinto beans with black beans in the refried beans recipe. this is by far the best grilled cheese sandwich I have ever had. Keep up the great work. I'm making this tonight. Note to self: Do the onions in advance because they take so long. I was visiting with friends who came over to the boat and didn't pay attention to cooking times. I'm waiting on the onions at this late hour. Good news is that I'll have enough left over carmelized onions for my Philly cheese steak with peppercorn sauce. I've got the chain meat from my beef tenderloin and I'm going to top that with more of these onions. Yay!!! It's been a fruitful day on the boat, with a fabulous meal yet to come. Angela: The leftover onions would be great on a Philly cheesesteak!